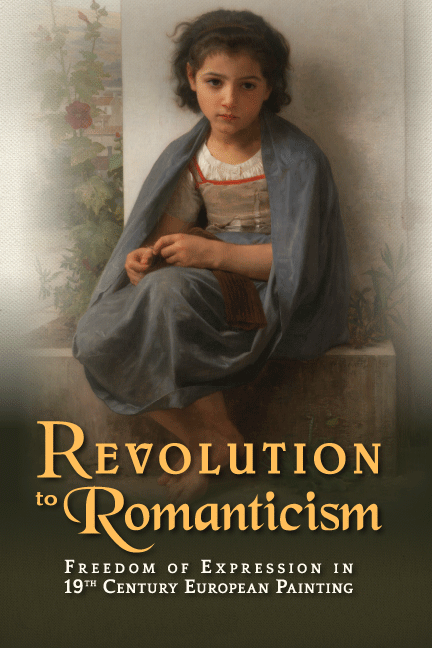 Featuring 27 exceptional paintings from The Knohl Collection, REVOLUTION TO ROMANTICISM – Freedom of Expression in 19th Century European Painting reveals how the profound social, political, and economic upheavals in revolutionary Europe affected the lives and canvases of 19th century artists. The bloodthirsty battles in North America and France, the rational philosophies of the Enlightenment, the alienation of growing industrialism, and the development of an upwardly mobile middle class all played a part in the evolution of the Romantic Art Movement. Many artists broke free from the constraints imposed by the rigid art academies and began to explore new techniques and develop new traditions. They used their canvases to express their individuality, explore their emotions, and seek spirituality and inner meaning. Their paintbrushes captured everything from the terror on the battlefields to intimate moments of maternal affection. They painted soldiers in distant lands, characters from ancient legends, and scenes from Shakespeare’s plays. Though their subject matter was as varied as their brushstrokes, Romantic artists all shared a commitment to place creativity and self-expression over artistic convention.